Originally published in 1845. 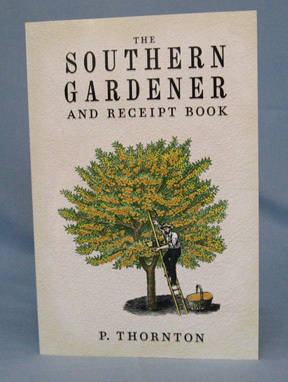 This book discusses how to raise numerous types of vegetables and other elements of agriculture (104 pages) for the region centered on Camden, South Carolina and trending to the southwest so the author assumes the planting times would suffice for most of Georgia and Alabama. The next chapter (pages 105 - 194) are devoted to "Cookery Made Plain and Easy." The recipes in this section are indeed relatively simple. However, since they include ways to preserve cranberries or make lobster pie, they aren't limited to food items from just Southern areas. The next chapter (pages 195 - 274) are devoted to "A Collection of Receipts for Domestic Purposes." The directions for useful items or instructions for doing certain actions are so varied it is impossible to summarize them all. But they range from such diverse topics as making capons, butter making, washing silk, and catching crows by making them drunk on rum. The next -- and shortest -- chapter (pages 275 - 318) is ""A Valuable Collection of Receipts for the Cure of the Diseases of Man." As in the other medical books, this information is provided for historic context only and should not be used in the treatment of any disease or condition. The last chapter (pages 319 - 395) is "A Valuable Collection of Receipts for Cure of Diseases and Common Distempers incident to [domestic animals]. As with human medical information, the information in this chapter is only for historic context and should not be used to treat diseases or conditions in any animal. About half the chapter is devoted to horses. The rest of the chapter gives about equal coverage to diseases of cattle, sheep, and hogs.